a system for naming chemically distinct substances. The first chemical nomenclature was developed in 1787 by a commission of French chemists under the chairmanship of A. L. Lavoisier. Before that, a substance was named according to arbitrarily chosen criteria, for example, the method of production, the name of the discoverer, or some property. Several synonymous names existed for each substance. The Lavoisier commission determined that each substance have only one name, which was to be easily pronounceable and not contrary to the rules of the language. Names of complex substances consisted of two words, one to indicate the class of compound and the other to identify the chemical species. In the beginning of the 19th century, national systems of chemical nomenclature, including the Russian system, were modeled on the nomenclature that had been proposed by the French scientists, which was based on the oxygen theory (seeOXYGEN). The modern nomenclature of inorganic and organic compounds was developed by international commissions, with the ambitious goal of expressing in words all the information contained in chemical formulas. In using the international chemical nomenclature, it is worthwhile to recall the words of A. M. Butlerov, written in 1859, concerning Russian chemical nomenclature: “although it [Russian nomenclature] agrees with the rules of general chemical nomenclature, Russian chemists still use the Russian names that developed from the everyday language” (Soch., vol. 3, 1958, p. 143). In 1869, D. I. Mendeleev wrote that “one should not be absolutely consistent in the matter of nomenclature: there are certain conventions …, which cannot be ignored without risking a loss of clarity, even among those who are accustomed to the style of chemical discourse. Of the several names that have been derived on the basis of varying degrees of rationality, one should choose … not only those names that most clearly render the features and composition of the given compound but also those names that are not disturbing in their awkwardness” (Soch., vol. 13, 1949, p. 283). were compiled from the scientific and educational literature. These fundamentals reflect the transitional state of the nomenclature in the 1960’s and early 1970’s. The names of the chemical elements are the basis of the nomenclature of inorganic compounds (seeCHEMICAL SYMBOLS). As a rule, the name of a compound consists of two words: one specifying the class of the compound, and one the chemical species. For example, in the name “sulfuric acid” the noun “acid” indicates the class of the compound—an acid—while the adjective “sulfuric” indicates that this acid is formed from a sulfur atom that is in the highest oxidation state. “Sodium sulfate” identifies this compound as a sodium salt of sulfuric acid. In both the international and Russian nomenclatures, the names of radicals—atomic groups that are transferred intact from one compound to another—consist of the Latin names for the elements and the suffix -il (-yl). Examples of such terms are gidroksil (hydroxyl) for the OH radical and karbonil (carbonyl) for CO. The historical names ammonii (ammonium) for NH4, tsian (cyan) for CN, rodan (thiocyanogen) for CNS, and amid (amide) for NH2 are retained. In the names of compounds that consist of atoms of two elements that are joined by a polar covalent or by an ionic bond, the name of the most electronegative element is given first. In the Russian rendering of the international nomenclature of inorganic compounds, the name of the electronegative element consists of the root of the Latin name of the element and the suffix -id (-ide). The name of the electropositive element is the second word of the compound name and appears in the genetive case. For example, khlorid natriia—literally, “chloride of sodium”—is the name for NaCl (sodium chloride) in the international nomenclature. The preferred symbol of the oxidation state of the electropositive element is a Roman numeral in parentheses. However, the following prefixes, adapted from Greek cardinal numbers are also used: gemi-, mono-, di, tri-, tetra-, penta-, geksa-, gepta-, oktao-, nona-, and deka-. Examples of such names are khlorid zheleza (II) and dikhlorid zheleza for FeCl2 (ferrous chloride); khlorid zheleza (III) and trikhlorid zheleza for FeCl3 (ferric chloride); sul’fid medi (I) and gemisul’fid medi for CU2S (cuprous sulfide); and sul’fid medi (II) and monosul’fid medi for CuS (cupric sulfide). khloristoe zhelezo (II) for FeCl2; and khlornoe zhelezo, trekhkhlo-ristoe zhelezo, and khloristoe zhelezo (III) for FeCl3. Oxides—compounds in which oxygen is bound only with more electropositive elements—are called oksidy in the international nomenclature and okisly in the Russian nomenclature. In order of increasing oxidation state of the electropositive element, in the Russian nomenclature the oxides are called zakis’ (protoxide, indicated by the suffix -ous), okis’ (higher oxide, indicated by the suffix -ic), dvuokis’ (dioxide), and trekhokis’ (trioxide). The oxidation state can also be represented by a Roman numeral. Oxides that are obtained by removing water from acids are called angidridy (anhydrides), a term that has been eliminated from the international nomenclature. Table 2 compares the Russian names of the oxides of chromium in the international nomenclature and in the Russian nomenclature. The aqueous solutions of compounds that consist of hydrogen bound to a nonmetal are acidic. The names of such compounds consist of the root of the Russian name of the nonmetal combined with the word vodorod (hydrogen). For example, hydrochloric acid, HCl, is called khlorovodorod, and hydrogen sulfide, H2S, is called serovodorod. The historical names of the other simple compounds of nonmetals with hydrogen have been retained. These include voda, H2O (water); ammiak, NH3 (ammonia); fosfin, PH3 (phosphine); arsin, AsH3 (arsine); metan, CH4 (methane); silan, SiH4 (silane); and boran, BH3 (borane). Hydrides—the compounds of hydrogen with metals—are termed gidridy. These include gidrid litiia, LiH (lithium hydride), and gidrid kal’tsiia, or digidrid kal’tsiia, CaH2 (calcium hydride). Hydrides are sometimes called vodorodistye metally (literally, hydrogenous metals). In the Russian nomenclature, the names of oxygen acids consist of the root of the Russian name of the acid-forming element and the following suffixes, in descending order of oxidation states: -naia, -ovaia, -istaia, -ovataia, and -ovatistaia. Examples are khlornaia kislota, HClO4 (perchloric acid); khlornovataia kislota, HClO3 (chloric acid); khloristaia kislota, HClO2 (chlorous acid); and khlornovatistaia kislota, HCIO (hypochlorous acid). Two acids that contain different numbers of water molecules but whose elements are in the same oxidation state are distinguished by the prefix orto- (ortho-) for more hydrated acids and meta- for less hydrated acids. Examples are fosfornaia ortokislota, H3PO4 (orthophosphoric acid), and fosfornaia metakislota, HPO3 (metaphosphoric acid). Acids containing more than one atom of the acid-forming element in the same oxidation state are called izopolikisloty (isopoly acids). The number of atoms of this element are usually given by a Russian prefix, although a Greek prefix is sometimes used. Examples are dvusernaia kislota, H2S2O7 (disulfuric acid); trikhromovaia kislota, H2Cr3O10 (trichromic acid); and chetyrekhbornaia kislota, or tetrabornaia kislota, H2B4O7 (tetraboric acid). The term pirokislota (pyroacid) is no longer used. Bases are called gidroksidy (hydroxides) in the international nomenclature and gidrookisi in the Russian nomenclature. If a metal forms more than one base, the oxidative state of the metal is indicated either by a Roman numeral in parentheses or by a Russian or Greek prefix. Examples are gidroksid zheleza (II), digidroksid zheleza, and dvugidrookis’ zheleza, Fe(OH)2 (ferrous hydroxide), and gidrosksid zheleza (III), trigidroksid zheleza, and trekhgidrookis’ zheleza, Fe(OH)3 (ferric hydroxide). The terms gidrat zakisi (lower hydroxide) and gidrat okisi (higher hydroxide) are no longer used in Russian. The names of salts in the international nomenclature consist of the name of the anion in the nominative case and the name of the cation in the genetive case. Anions of oxy acids are named by combining the root of the Latin name of the acid-forming element and the suffixes -at (-ate) or -it (-ite). The suffix -at indicates a higher oxidation state of the acid-forming element, while the suffix -it indicates a lower oxidation state. For example, the sulfate ion, SO42-, is called sul’fat-ion, and potassium sulfate, K2SO4, is called sul’fat kaliia; the sulfite ion, SO32-, is called sul’fit-ion, and sul’fit natriia is the term for sodium sulfite, Na2SO3. If the number of acids formed by an element in its various oxidation states is greater than two, the name of the anion in which the element is present in the highest oxidation state has the suffix -at (-ate) and the prefix per-. In decreasing order, the oxidation states are indicated by the suffix -at (-ate), the suffix -it (-ite), and the suffix -it in conjunction with the prefix gipo- (hypo-). Examples are perkhlorat-ion, ClO4- (perchlorate ion); khlorat-ion, ClO3- (chlorate ion); khlorit-ion, ClO2 (chlorite ion); and gipokhlorit-ion, ClO- (hypochlorite ion). In the nomenclature of salts, the oxidation state of the cation is given by a Roman numeral in parentheses; for example, ferrous sulfate, FeSO4 is called sul’fat zheleza (II), while ferric sulfate, Fe2(SO4)3, is sul’fat zheleza (III). In Russian, the prefixes orto- and meta- are included when naming the anions of orthoacids and metaacids. Examples are ortofosfat-ion, PO43- (orthophosphate ion), and metafosfat-ion, PO3- (metaphosphate ion). The names of anions of acid salts have the prefix gidro-; for example, gidrosulfat-ion, HSO4- (bisulfate ion), and digidroortofosfat-ion, H2PO4- (dihydrogenphosphate ion). The names of cations of basic salts have the prefix gidrokso- (hydroxo-) or okso- (oxo-); for example, gidroksomagnii-ion, MgOH+ (hydroxomagensium ion); digidroksovismut (III)-ion, Bi(OH)2+ [dihydroxobismuth (III) ion]; or oksovanadii (III) -ion, VO+ [oxovanadium (III) ion]. Often, nonstandard names of salts are used. Examples include bikarbonat natriia, NaHCO3, instead of the preferred gidrokarbonat natriia (sodium bicarbonate); bikhromat kaliia, K2Cr2O7, instead of the preferred dikhromat kaliia (potassium dichromate); and metabisul’fit kaliia, K2S2O5, instead of the preferred disul’fit kaliia (potassium metabisulfite). Old names of compounds also occasionally persist in usage; these include kuporosy (sulfates), kvastsy (alums), and selitry (nitrates). Luchinskii, G. P. “Nomenklatura neorganicheskikh soedinenii.” In Kratkaia khimicheskaia entsiklopediia, vol. 3. Moscow, 1964. Materialy k proektu nomenklatury neorganicheskikh soedinenii. Moscow, 1968. Nekrasov, B. V. Osnovy obshchei khimii, 3rd ed., vol. 2. Moscow, 1973. Laboratornyi praktikum po obshchei khimii, 2nd ed. Edited by S.A. Pogodin. Moscow, 1972. Pages 27–33. Busev, A. I., and I. P. Efimov. Slovar’ khimicheskikh terminov: Posobie dlia uchashchikhsia. Moscow, 1971. Nomenclature of Inorganic Chemistry: Definitive Rules for Nomenclature of Inorganic Chemistry. London, 1959. Crosland, M. P. Historical Studies in the Language of Chemistry. London, 1962. Organic compounds. In the initial period of the development of organic chemistry, compounds received random, trivial names on the basis of their natural sources, characteristic properties, or the names of scientists. Some such names have been retained up to the present. One compound may have several systematic names, depending on the fragment selected as the basis of the name, as in example (V). A rational system of names in part based on functional groups has become the modern nomenclature of organic chemistry. The system was devised by the International Union of Pure and Applied Chemistry (IUPAC) and was adopted in the 1950’s and 1960’s. The IUPAC rules also use the names of the substituent features of a compound; the substituent names are a further development of the Geneva and Liège nomenclatures. 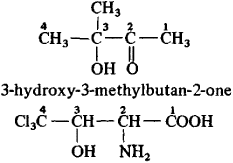 4-phenylbuten-3-one, and methylbenzylacetic acid is 3-phenyl-2-methylpropanoic acid. When naming compounds that contain several different functional groups, only the primary functional groups are reflected in a suffix; the secondary functional groups and radicals are listed as prefixes. 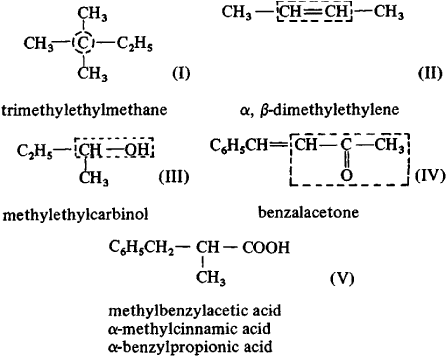 The prefix form of the name of a functional group differs from the suffix form (see Table 3). The IUPAC rules do not specify details for writing names; matters such as word breaks, the position of numerical elements, and the use of commas or periods are left to the discretion of each individual country, in accordance with the rules and traditions of the native language. Spravochnik khimika. [Dopolnitel’nyi tom.] Leningrad, 1968. Nomenklatura organicheskikh soedinenii. Moscow, 1955. IUPAC's activities in the naming of new elements and in nomenclature of chemical compounds often appear in the popular press and are noticed by the general public.